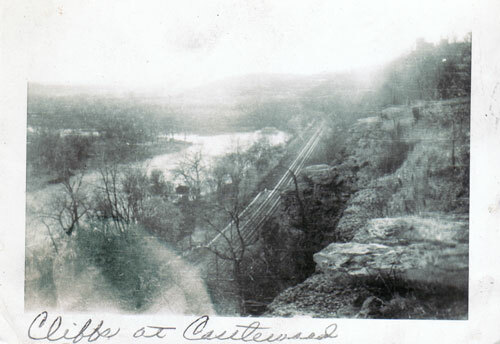 During its pre-1950s heyday, the center of attraction at Castlewood was Lincoln Beach on the south bank of the Meramac River (shown at a distance in the photo above). But the major concentration of clubs were high above the river to the north of the cliffs. A Grand Staircase connected the residential area with the river. At the river, there was a hotel and small store. A 10-cent ferry took bathers across to the beach. During the 1930's children would walk across the rapids in groups to avoid paying the fare. Location: on the north bank of the Meramec River, at the end of Keifer Creek Rd, well to the east of the view above. 1972 Burned down, reportedly by volunteer firemen who want the $2 fire-response fee to party. Memory. "I witnessed the aftermath of a drowning which took place near Lincoln Lodge. My father, being a volunteer fireman, was out in a boat looking for a boy who had drowned, when I saw a second boy, being escorted on the arm by his father, down to the river. His father made the teen point to the area where the other boy went down in the water. They found the body the next day a little farther down stream. People are right in stating that there are whirlpools and treacherous undercurrents in that river." Photo: view from cliffs looking west, down at railroad tracks and Meramec River. Circa 1940 Contributed by Kathleen Price.